MANILA -- Justice Secretary Menardo Guevarra on Friday welcomed Senator Antonio Trillanes IV's petition before the Supreme Court (SC), asking the High Court to grant a temporary restraining order (TRO) that would stop the military and police from arresting him after his amnesty was voided via Proclamation No. 572. “Proper move indeed, instead of arguing his case in the media,” Guevarra said in a message sent to reporters. Guevarra on Thursday challenged Trillanes to appear and prove before the court his claim that he complied with all the requirements to be eligible for amnesty in 2011 regarding his role in the attempts to overthrow the Arroyo administration. “Sa court niya sabihin yan (Let him tell that to the court),” he said in a text message sent to the Philippine News Agency (PNA). 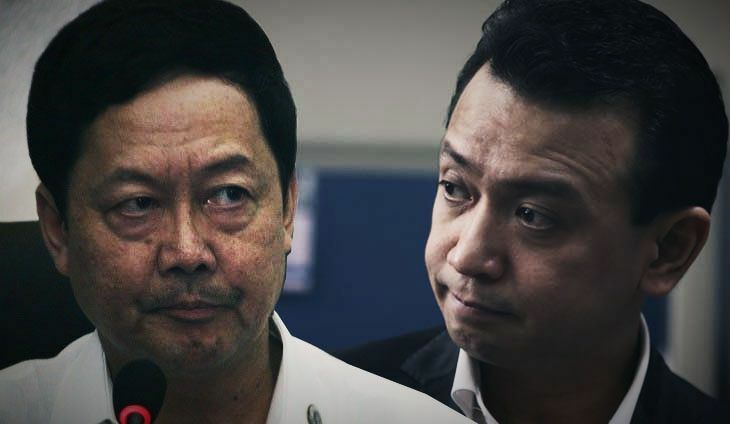 Trillanes argued that he cannot be arrested since the cases against him at the Makati Regional Trial Court (RTC) have been dismissed on the basis of the amnesty granted to him in 2011 by then president Benigno “Noynoy” Aquino III. Makati RTC Branch 148 Presiding Judge Andres Bartolome Soriano has set the hearing on the motion of the DOJ for the issuance of an alias warrant of arrest and hold departure order (HDO) against Trillanes on September 13. He has also ordered the senator to file a comment within five days from receipt of the order. “The court has issued certain orders. The case has in fact been revived,” Guevarra noted. Meanwhile, Guevarra, who was guest speaker at the anniversary celebration of the National Police Commission, asked the public to refrain from voicing their opinions on the voiding of Trillanes’ amnesty, as the case is already pending with the SC. “I respectfully ask everyone to please stop commenting on these issues already, because it’s already with Supreme Court,” Guevara told reporters in an ambush interview. “We will all be cited for contempt of court if we continue to discuss this matter, these legal issues, which are already pending before the Supreme Court,” he noted. Guevarra said there is no problem with comments, provided that the people making them have seen the pieces of evidence personally. “I don’t mind people bashing me for what I have said publicly. That’s okay, that’s part of free speech. Ang hinihiling ko lang, sana bago magsalita ang ibang tao, ay meron silang matibay na pinagbabasihan. Nakita nila ‘yong documents, bago sila nagkukumento (My only request is that before they comment, they should have strong basis. They must saw the documents before commenting),” he said. In a 36-page petition for certiorari prohibition and injunction, Trillanes questioned the legality of the proclamation, which invalidated his amnesty. The senator argued that the proclamation violates the constitutional grant of "shared power" between the executive and legislative branches in the issuance and withdrawal of amnesty grant. "The power to grant amnesty is not just the sole prerogative of the Executive. Under the Constitution, this power, to be validly exercised, requires concurrence of both Houses of Congress," he explained, citing Article VII, Section 19 of the Charter. Named respondents in the petition are Executive Secretary Salvador Medialdea, Justice Secretary Menardo Guevarra, Defense Secretary Delfin Lorenzana, Armed Forces Chief of Staff Gen. Carlito G. Galvez, Interior Secretary Eduardo Año, Philippine National Police chief Director Gen. Oscar Albayalde, and Criminal Investigation and Detection Group chief Director Roel Obusan. Based on the proclamation signed by Duterte last Aug. 31, Trillanes has no pending application for amnesty granted to all active and former personnel of the Armed Forces of the Philippines and supporters who joined the July 27, 2003 Oakwood Mutiny, the February 2006 Marines stand-off and the Nov. 29, 2007 Manila Peninsula incident.